Description: Southbound rack train at Cordele. 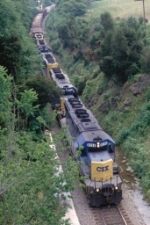 CSXT 8441 was originally UP SD40 3114, rebuilt to SD40-2 by Morrison-Knudsen 6/2/90. Date of photo approximate. Description: CSX SD40-2 8441 leading a NB train out of Manchester, Ga. CSX SD40-2 8441 is a rebuilt SD40. Description: CSX manifest Q301 cruises east along the high line above Amtrak's 30th St. Station grounds led by a pair of bright future EMDs. Description: Taken from the 5th floor of the yard tower. Description: The tank cars in the background are lettered for SCL. Description: Waycross locomotive shop and the east side of the Rice Yard. Description: Q247 at Hoots Chapel Rd. Description: Q501 crosses the NS at Leipsic Jct. Description: A wild locomotive history for this CSX unit ethanol train, shoving south on the CSAO Chemical Coast Secondary & pounding the diamond at CP-PD; CSX 8429 is ex-C&O SD40 7478, blt 2/73, and CSX 8441 is ex-UP SD40 3114, blt 10/71!! Description: Heading for Gibraltar Rock quarry in Belle Mead, Route 601, 10:57 hours.